Another family time was celebrated in churches all over America. Grandparent’s Day has been around for a long time. It began as an idea of Marian Lucille Herndon McQuade, a West Virginia homemaker and mother of 15 children. In 1970 she began a campaign to establish a special day to honor grandparents. She attracted the support of businesses, churches, civic groups and political leaders. West Virginia Governor Arch Moore declared the first state-wide celebration of Grandparent’s Day in 1973. The same year, West Virginia Senator Jennings Randolph introduced a Grandparent’s Day resolution in the U.S. Senate, which languished in committee. Mrs. McQuade and her many supporters gathered media support for a National Grandparent’s Day and began contacting political representatives in every state as well as national organizations interested in senior causes. In 1978, five years after Grandparent’s Day was first recognized in West Virginia and eight years after she began her campaign, McQuade succeeded. A federal proclamation was created in 1978, passed by Congress and signed by President Jimmy Carter. The statute cites the day’s purpose: “…to honor grandparents, to give grandparents an opportunity to show love for their children’s children, and to help children become aware of strength, information, and guidance older people can offer”. National Grandparent’s Day was first celebrated on Sunday, September 9, 1979. I want to begin by saying the steeple on a church building holds no special power in itself. It is just a part of the architecture of the building – nothing more – nothing less. With that said, I also want to tell you something else: The Holy Spirit can use anything and anybody He wants to communicate with His children! Lately, I have noticed steeples on churches. They do not speak to me, but God’s Holy Spirit uses them to get my attention and then HE does plenty of talking. This “steeple mania” began a few months ago while my husband and I were on an extended road trip. It may have begun as the result of an overdose of caffeine, but remember, God can use anything! We were traveling down I-35 heading East. We were near St. Louis and I happened to look out the passenger side window of the truck. It was not a special view, rather one I had seen many times before. Something caught my attention this time. I noticed a very large steeple centered right in the middle of the scene. I always keep my camera handy. I took a shot of that landscape, with the steeple right in the center. That is where it began. 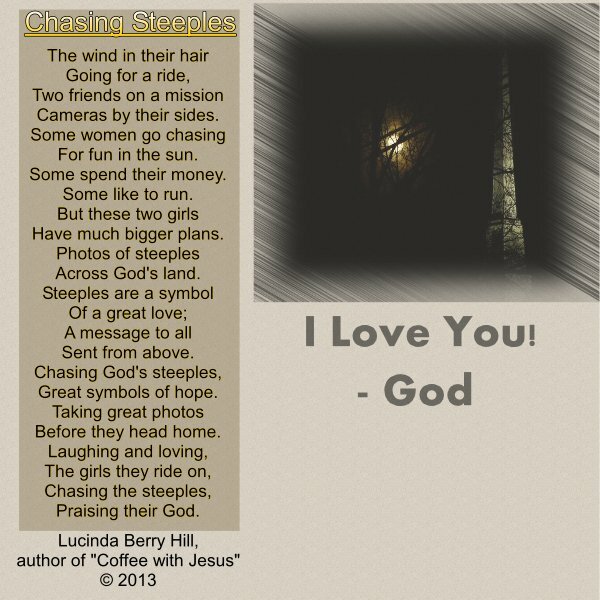 I shared what happened with my friend, Lucinda Berry Hill, and she wrote this wonderful poem. She also took the awesome photo that I used for the design. Since that time, many conversations about steeples and churches and how awesome the power of God’s Holy Spirit is have followed. God wants us to talk about how wonderful HE is. Steeples on churches point the way to heaven. They are all around us, quietly reminding us that there is a God and He loves and cares for us so much. Let’s not take our house of worship for granted, for it could get taken away – yes, even in America. Don’t kid yourself into thinking it could not happen. How do you feel about dreams? Are they another way for God to communicate with us? God used dreams in the Bible. I had a dream shortly after our trip back East. When I woke up, I wrote this poem. God’s Holy Spirit has something to say, not just to me, but I believe to all Christians.